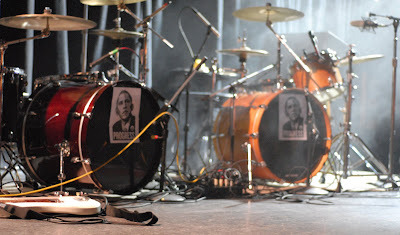 Just one day after the start of the presidential primaries I was ambushed and confronted by Barack Obama’s political campaign at a Metro show. Chicago rock quintet Office fronted double drummers who proudly displayed reverberating flyers of the Illinois Senator and Presidential hopeful. I don’t think Obama has ever rocked so hard (or has ever played the drums before) and after the show I’m not sure who’s giving him the biggest headache, the Office rhythm section or Hillary Clinton and the GOP. No Bears. No Prince. No Problems?